While many of you probably already have your Mole Day activities lined up, I thought I'd take a moment to offer up some things that I consider vital to do honor to the number, the animal, and our dear chemist Avogadro this October 23rd. First of all, I'm shocked that my Zemanta plugin hasn't suggested any links to the zillions of articles, pictures, and videos surrounding this highly-vaunted chemistry holiday... oh, wait, there it goes. Second of all, there may be a few unenlightened souls remaining in the canvas of humanity regarding Mole Day. Every October 23rd from 6:02 AM to 6:02 PM, chemists everywhere gather to worship honor a fundamental mathematical constant, Avogadro's number, which equals 6.02 x 10^23 and is named after cute-ified versions of the miscreant rodents that tear up your front lawn, especially when you are trying to put it up for sale. Third of all, yes, Mole Day is inferior to Pi Day, but better than Intermediate Value Day. So, what does one do on Mole Day? I believe that Punxsutawney Phil is overrated. All he does it predict the weather, and we have excellent weatherpeople every where who do just that with fractionally greater accuracy. What we really need is a Milledgeville Molly. Of course, since we don't have that, yet, you will just need to find a mole yourself (you can look for people that just put up their home for sale--they will typically pick those houses about 2-3 days after the sign goes up). Watch carefully to see if he sees his shadow. If so, he will run back into his hole which will mean six more weeks of chemistry before Christmas Break. Image via WikipediaFood is definitely important for every holiday, and Mole Day is no different. I know of know culture that would desecrate these cute little rodents, but I do know of several people that enjoy a bowl of guacamole. Of course, I don't happen to know the atomic weight of jicama, so I offer no guarantee that this will make excellent dip. Other possible foods... just thinking out loud here... mole (the dip), mole slaw... maybe take marshmallows and over them in shredded coconut rolled in chocolate sauce... okay guacamole is your best bet. Actually, Moldovia, defying common knowledge, is a principality that no longer exists. Instead Moldova is a Eurpoean state that sits land-locked between Romania and the Ukraine. The m ajority of its citizens speak Romanian. It's original name is thought to have come from either the German word meaning "open-pit mine" or the Gothic word meaning "dust" or "dirt". When you visit Moldova, you do the things that you do when you visit any European country: Visit really old buildings and try the local wine. Make sure to visit the following Mole Cathedral on the left. Just to add some zest to the day, consider renaming yourself to Molly for the day. Or renaming everyone else to Molly. Q: What did Avogadro teach his students in math class? Q: Why was there only one Avogadro? Q: How much does Avogadro exaggerate? 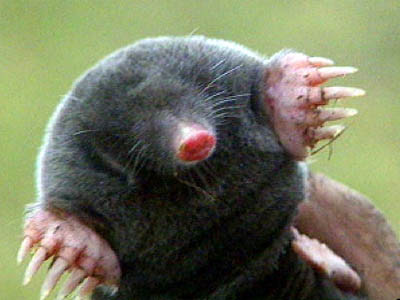 Or you could see mole songs. While I don't remember all the words, I distinctly remember Mr. Steed in 10th grade having us listen to a guy with a guitar singing: "A mole is a unit, or have you heard? It's 6 times 10 to the 23rd. something, something, something, that has no end, it's much too big a number to comprehend." Then, the song goes into all kinds of comparisons about how big 6x10^23 is. An Avogadro's number of soft drink cans would cover the surface of the earth to a depth of over 200 miles. If you spread Avogadro's number of unpopped popcorn kernels across the USA, the entire country would be covered in popcorn to a depth of over 9 miles. If we were able to count atoms at the rate of 10 million per second, it would take about 2 billion years to count the atoms in one mole. If you were to loyally celebrate Mole Day every year for Avogadro's number of years, it would take you 6.02x10^23 years to do it. So, if you haven't already had it on your calendar for the last six months, remember that Mole Day is tomorrow, October 23rd at 6:02 AM. Enjoy!